Cookies and biscuits are the thing I make most often at home. Surprisingly I'm not a huge fan of cake any more, maybe I see too much of it through my work to enjoy it these days. But cookies and biscuits... I could never get never get fed up of! I always have a batch of frozen cookie dough stashed in the freezer, firstly it stops me eating the whole batch, secondly it's always handy to have something you can quickly bake off fresh in an emergency, I hate having nothing to offer visitors when they call, equally I can never go and visit anyone empty handed and packet biscuits just won't do. 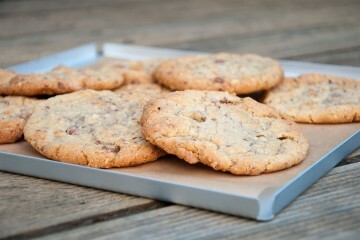 The violet bakery chocolate cookies are my usual go to recipe, they work really well with milk, white or dark chocolate. In this recipe I've given them a bonfire night twist with chewy toffee and dried apple pieces. The balance between the two works really well in a cookie – I like the slight sharpness the apples bring stopping it from being overly sweet. Give them a go and I'm sure you'll love them too! Roughly chop up your dried apple into small pieces, followed by the toffees. If your toffees are hard to cut it's safer to put them in a plastic bag and smash them into pieces with a rolling pin. Put your apples and toffees into a bowl and set aside. Next put both your sugars, butter and vanilla into a mixing bowl, I use my freestanding mixer with paddle attachment. Beat the ingredients together until creamy, you want them to be just mixed and smooth, not fluffy like when you make a cake. Next while still mixing on a slower speed add your egg yolks until just combined, you may want to scrape down the sides of your mixing bowl to make sure the ingredients are evenly mixed. In a separate bowl weigh out your flour, measure your salt and bicarb and sieve into your butter and egg mixture, mix together on a slow speed until the dough looks even. Lastly add you toffee and apple pieces and mix thoroughly, either with the mixer on a slow speed or with a wooden spoon. Line a small baking tray with baking paper and scoop balls of cookie dough onto the tray, I use an ice cream scoop for this part so I get all my cookies portioned exactly the same. 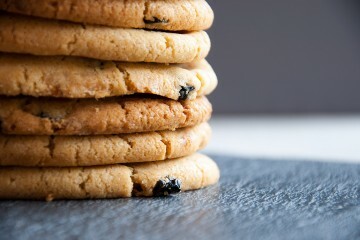 Alternatively you can weigh out spoonfuls of dough at around 70g per cookie. Once you have portioned out all your dough cover the tray in clingfilm and pop it in the freezer, freezer for an hour or you can freeze them for up to a month. I usually bake some and keep some frozen in a freezer bag for another day, its always handy to have something frozen you can bake off fresh when you need. Pre heat the oven to 160’c fan/180’c/gas 4. Line a couple of baking trays with a good non stick baking paper. Spread out your cookie dough balls evenly on the baking tray giving them plenty of room to spread out, leave them rest at room temperature for 5 minutes before putting in the oven and baking for around 18 minutes. I’d usually fit 4/5 on each tray and bake in batches. The cookies should be turning slightly golden on the edges but still be gooey in the middle. Leave the cookies cool on the tray for 10 minutes before transferring to a cooling rack, they are very soft when they come out of the oven but will firm up on cooling. Cookies will keep up to 5 days in an airtight container.